Martial arts are an ancient method of training your mind, body and spirit to act as one. It teaches kids about athleticism and fair play, while improving their balance, agility, body positioning, body awareness, strength, flexibility, mental equation and much more. The practitioners strive for harmony, but also learn effective and often devastating self-defense techniques. Children who get involved in martial arts reap many benefits in several areas of life. Most martial arts originated in Asia and include karate, kung fu, jiu jitsu, aikido, taekwondo, judo and muay Thai. Fostering Self-Discipline – Self Discipline is one of the most important aspects of any form of Martial Arts forms. With a calm, yet concentrated approach, you learn to discipline yourself and engage in intrapersonal communication. If you have mastered it, then you can master the form too. Boosting Socialization Skills – When kids are certain in a kind of environment they get comfortable with, they find it easier to get to know people and make new friends who share a common interest. Hence, communicating with each other makes your kid comfortable and they are able to achieve better results. Besides, there’s no fear of missing out either. Encouraging Physical Activity – High fitness levels, physically active and flexible body are some of the perks of practicing Kung Fu. Enrolling an inactive child in such a physically demanding activity not only discourages the sedentary lifestyle he/she is accustomed to, but also gives them a chance to have fun. Learning to Set and Achieve Goals – Without a motive, life won’t serve you well; Unless you set goals, you will never be able to feel the sense of accomplishment. The colored belts that signify the wearer’s degree of skill is what results in when you set goals in Kung fu and thrive to achieve them too. You strive to become better with each move, when the warrior in you, kicks in. Increased Self-Esteem – Confidence comes with achievement, so your child’s self-esteem level will get a boost with every new move he/she masters and every belt they earns. Kids who struggle with a low sense of self-worth usually become more confident as time progresses while they’re enrolled in a kung fu class. Instilling a Sense of Respect – It’s the master that makes you a master. Unless you respect the rules, schedule, punctuality and in aggregate the soul of Kung Fu, you will never be a Kung Fu master ever. Encouraging Non-Violent Conflict Resolution – Many defensive styles teach kids peaceful, non-violent conflict resolution skills and emphasize the importance of avoiding a physical altercation. 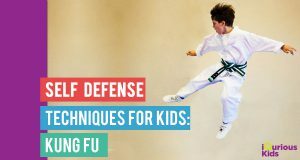 Increased coordination & motor skills – Children with strong bodies, finely tuned motor skills and physical coordination developed through kung fu will have improved: general health, sports performance, that will transcend to other physical activities and sports.